Click to bid or buy now. The subject: Mervin is a special kitty that we saw on our vacation to the Keys. He is a feral cat who often sat in front of an open shop door. The owner tried to entice him inside with treats and he would only get to the opening before backing off. We found out that he finally made the trip across the threshold shortly after we left. Luckily for me, he was happy to pose for photos. The process: Getting the softness of the fur and the color are difficult. But, painting a cat is really fun and I hope to improve my technique each time I do a new one. Surface: A cradled wood panel is just a wood panel that has a solid wood frame. I used a 3/4 inch cradled panel and this makes it possible to simply hang as is, no frame necessary. I have also stained and varnished the sides of the cradle which give it a very finished look! You can see the cradle from the side photo I took below. 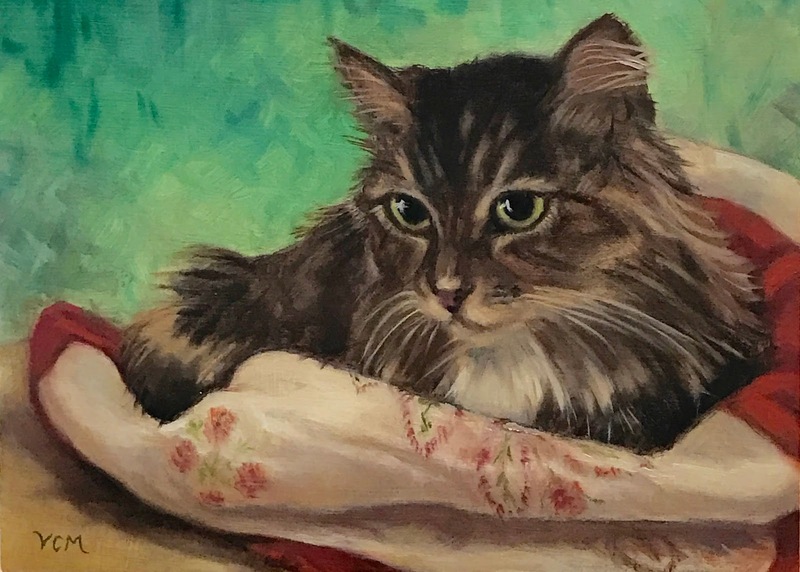 This is my second painting of my cat Sammy. Sammy is so beautiful and he loves posing for pictures. 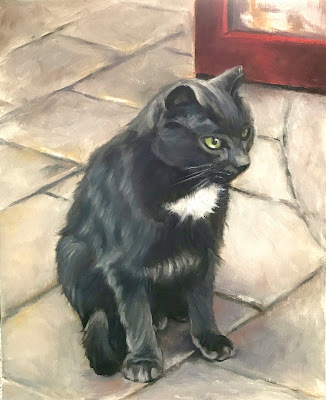 My first painting of him won 2nd Place in the Pasco Fine Art Center's Art Annual in 2015. It was my very first art award, so I can't put it up for sale. I've also decided to keep Christmas Kitty, at least until I paint another one. I also used a cradled wood panel and loved working on this surface. I stained and varnished the sides of the cradle and now it looks good without framing. Here's a photo of me looking super happy over my award for my first Sammy painting. Click here to view or bid in the auction for this painting. The subject matter: My grandchildren are great subjects for people in motion because they are always moving. The play of light and shadow fascinates me and hopefully I've captured it. Simplifying is still a mystery to me, but I'm getting there. I left out many details in the background and it helped the painting. The surface: This painting is a 12x9" on Gessobord to which I've added an oil-based primer. I did this to infuse more light into my colors. I will not do this again! At least not on a gessoed board. The oil-based primer made my paint slide off the panel. Finally, after several layers of paint, it began to adhere. 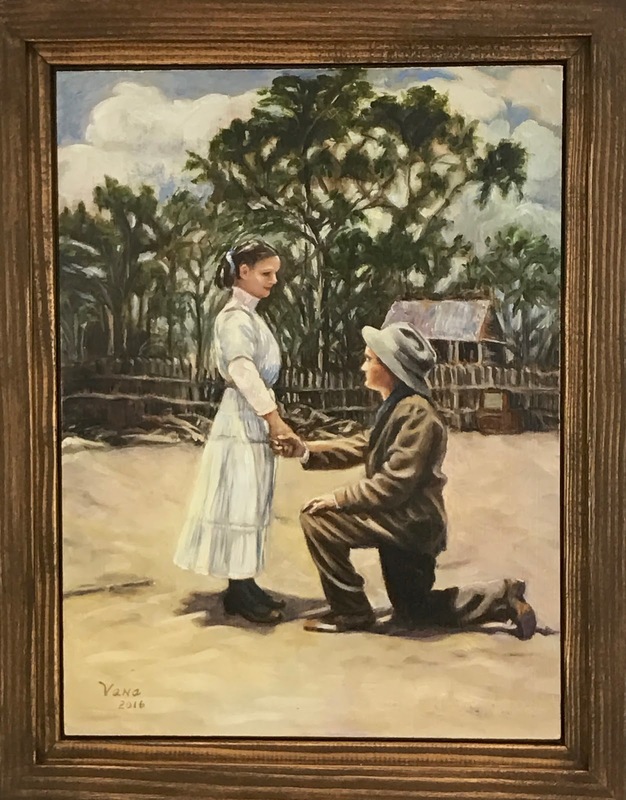 Click here to view or bid in auction. 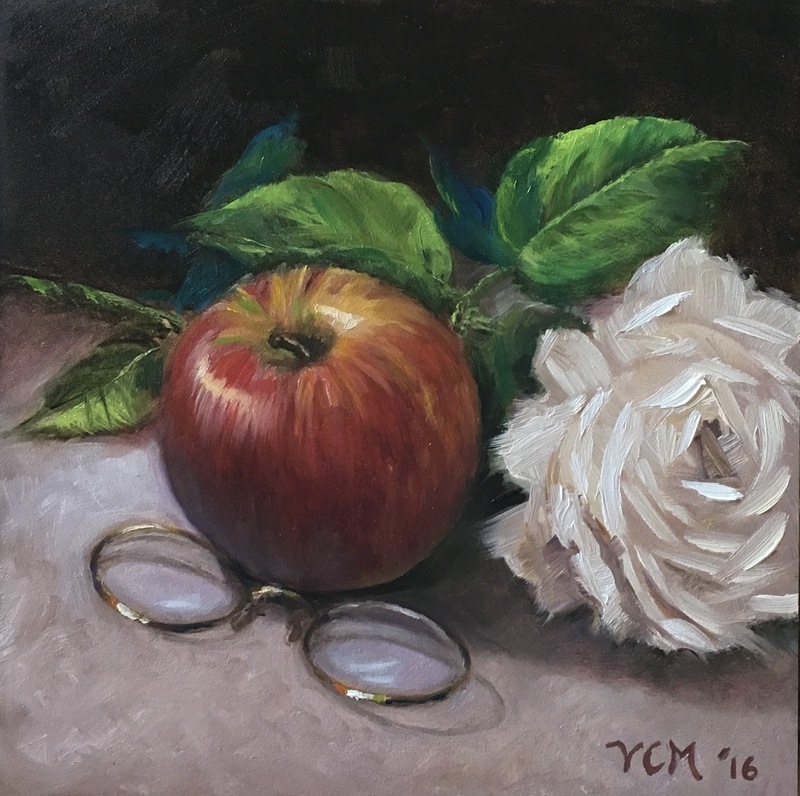 My Red Apple Study is an interesting little painting. It started out as a green apple study, but I'm not a fan of green apples so I turned it into a red one and added some apple slices. I haven't posted anything in quite a while though I have been painting. I wasn't happy with one of the paintings that I worked on and kept trying to make it better. The painting is one of some mailboxes on my street. I will probably try it again when I recover from my disappointment. I've put a picture of the painting at the bottom of this post. For those of you who are not artists or who paint only on canvas and who might be wondering about "Gessobord": It is the brand name of a type of panel used frequently by oil painters. Many of the old masters used wood panels. Panels are fun to paint on and Gessobord panels come with the gesso already on them. I also do my own gesso on some hardboard and wood panels. 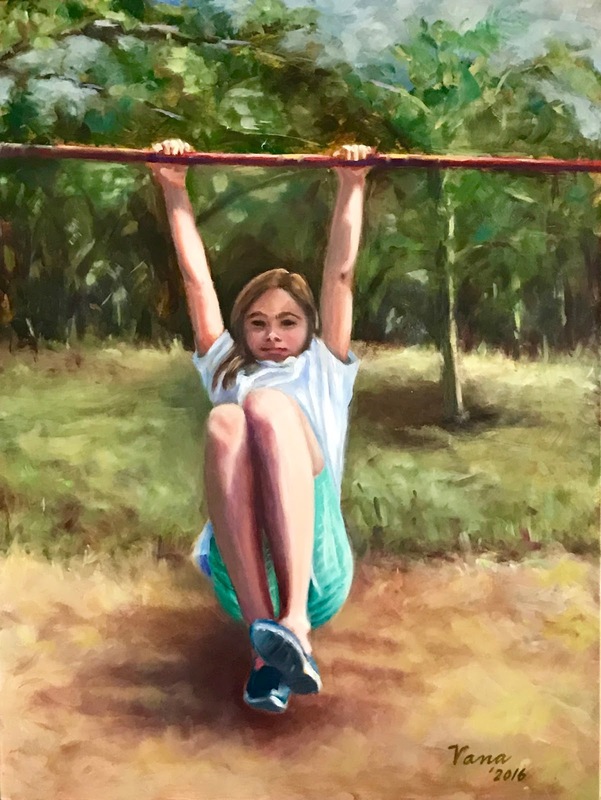 This is the painting that I entered in the Historical Pasco Contest at the Pasco Fine Arts Center. It was awarded Honorable Mention and I was pleasantly surprised because there was some beautiful art in this competition. The idea originated from an old black and white historical photograph taken in 1912 close to my home. They looked so young and vulnerable that it really made me want to paint them. I had to guess about the colors, so I did a little research on the colors worn by people of this era who were not wealthy and possibly even domestic workers, farmers, or sponge divers. This painting is for sale; however, all of the paintings at this show will go on display at St. Leo college after the competition is over. For this reason I will not put it up for sale here until this show is over. It is also framed in a beautiful stained wood frame which you can see below. Yeah! I finally finished re-publishing my old posts that I transferred over from my old blog site. If you receive email updates, you may suddenly get a host of them. This should be the last time this happens. Thanks for bearing with me during this process. 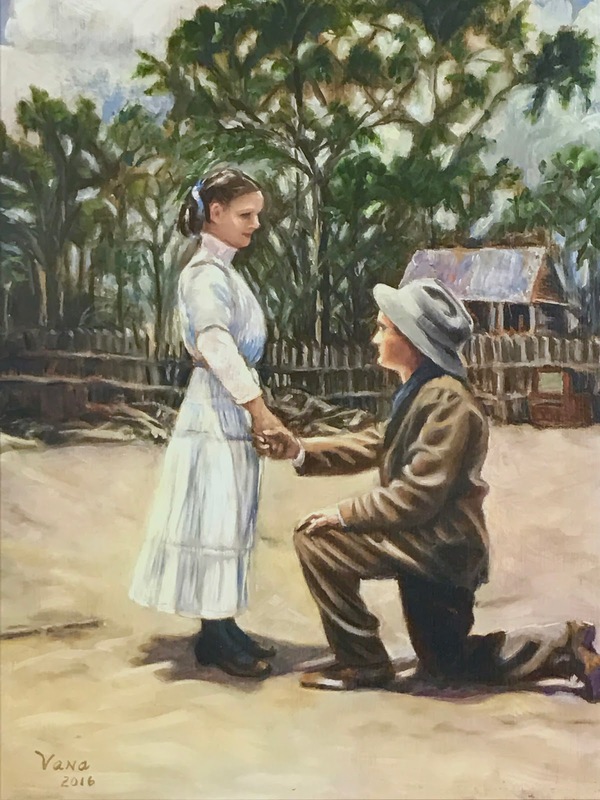 Finally finished my painting for the Historical Pasco contest and so I'll be getting back to my focus on painting small and often. Click to view or bid in auction. These beautiful flowers came from my deck, the only place I have any real sunlight due to all my trees. I love begonias because they are so easy to care for and they don't mind a little shade--which I have an abundance of because of the large trees in my yard. The greenish white silverdust plant is a gorgeous plant and much easier to paint than the begonias. This beautiful terracotta pot, which is quite old and large, came with my little 1930's house. Although this is a gessoed panel, Ampersand calls it a primed canvas-texture wood panel. It's a little thicker (3/8") and comes ready to hang--no frame needed unless you really want one. It was perfect for a nature painting, but I think the texture would have been too noticeable for a portrait. 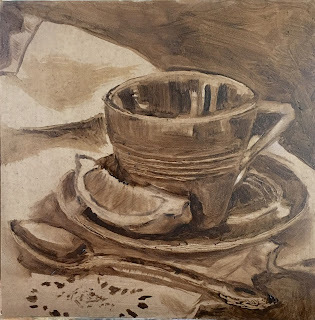 Underpainting: I toned my panel with a wash of burnt umber. After this was dry, I massed in the darker tones and a few of the colors. I've been reading Helen Van Wyk's book, Painting Flowers the Helen Van Wyk Way. Still haven't quite mastered "massing in," but will keep trying to do it. It's a very important step in avoiding the "detailitis" problem that I spoke about in my last post. 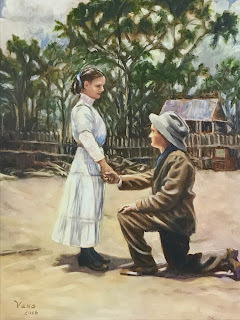 If you have never heard of Helen and want to paint, Google her and you'll be amazed. Her Welcome to My Studio was the longest running PBS show about painting ever! My husband loves to imitate her accent which is quite humorous (his imitation, not her)! 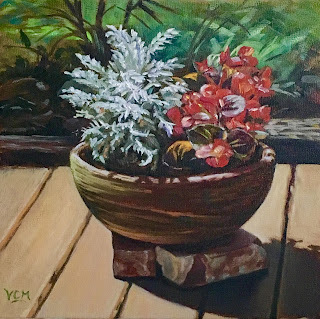 Painting copper: This was fun to paint. I learned that it really only takes a little burnt sienna to bring out the coppery tones. Of course, there are other colors but this seems to be the key hue. I love the shape of this kettle. I have a stainless steel one that is almost the same shape. I wanted copper, but it won't work on my cooktop. Signature: Still struggling with the signature blues, but I managed to sign my entire first name, which is harder than it looks. Writing with a paint brush in oil paint is extremely difficult; entire articles (maybe books--ha, ha) have been written about it. I have an unusual first name so I would rather use this than my initials. I'm going to try this from now on and see how it works. I can print capitals more easily than lower case letters but it looks bad, so I'm mixing them. Click here to view or bid now. The Ironstone Pitcher: As you may know by now, I love old things. I love this vintage pitcher for its simplicity and usefulness. Painting white is all about learning to see the myriad colors inside that white, particularly in the shadow areas. Focal points: I am still struggling with focal point and have read that it's okay to have more than one as long as one is dominant. In this painting, by including both the red spoon and the red tomato, I have done that. I didn't set out to do this, but without the tomato (which was not in my original arrangement), it felt as if something was missing. Since studying Shakespeare didn't prepare me for my new "career" in art, I sometimes just go with my gut. Comments from my followers and others would be welcome. Click to view or bid now. The white rose: I am still in my infancy when it comes to painting roses; however, this one is a big improvement over my previous ones. I wanted to stay loose and I think I achieved that. Watching some You Tube videos has helped me with this skill. For those struggling like me with staying loose, putting your strokes down very quickly is the key. However, "detailitis" people are fearful of quick, seemingly random strokes. But, I was amazed at how much fun it was! 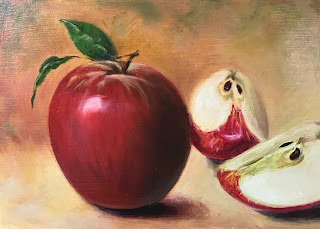 The apple: I really love painting apples and I prefer painting apples that are not "Snow White" perfect. 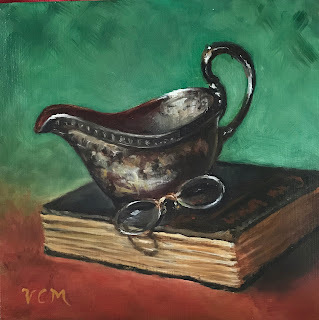 The pince nez: This is the second time I've painted this little pair of vintage glasses. The stamp on the very old case says they were bought in Huntsville, Alabama. Though my grandparents were not from Huntsville, they did live in Alabama. In this painting I hoped to capture the softness and subtle gradations in color of a plate of peaches. Though daily painters often try to paint in one day, I was interrupted during this endeavor and had to return to it several days later. That was a good thing because the painting still needed more work to bring out the color and highlights. I also found a nifty tool at Keeton's in Bradenton. It's called a grainer. This brush creates a broken line and I used it for the stripe on the towel. However, I wish I'd also bought the smaller size because I had to turn it on its side because the stripe was too large. 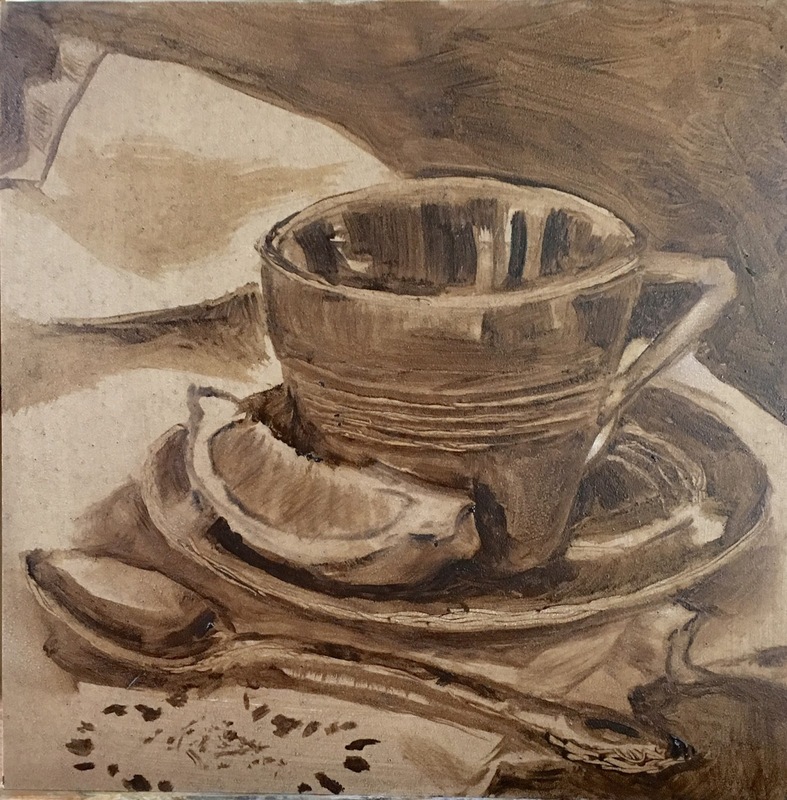 Value Study: I did a value study for this painting after reading about this in Carol Marine's book. I find that by doing an underpainting for most of my paintings, I've already been doing this. It is a big help to establish the lights and darks before adding color. As usual, I used burnt umber and mineral spirits. The most difficult thing in painting this was deciding what to paint. I encountered what's known as a "block" and simply couldn't paint. Fortunately, once I start I usually get over the block and that's what happened. Setup: As Picture 2 shows, I was using both a photo and a shadow box. I find that I can see more colors if I do it this way. Also, I'm using my new panel holder designed by Carol Marine's husband so that painting to the edge on a small panel is easier. K. Rike Gallery makes them. They are not too expensive and really work! Underpainting: Picture 3 is my partial underpainting. At this stage I really felt I might have to throw this one away. However, after getting some of the vase painted, I began to feel better about it. Feline Assistance: Of course, cats have to get in on the act as Picture 4 shows. The rather large cat is Jimbo, a very good natured cat who has recently lost weight (after being put on a diet by his vet). He is feeling very frisky these days and jumps around a great deal more. I was a little surprised to see him in the shadow box because it's quite a leap from a nearby stool to the inside of the box. This painting was created for the Daily Paintworks "Vegetable Challenge." This was challenging indeed! My criminal cat Binkie decided that the parsley looked interesting. She tried to eat it and when that was not to her satisfaction, she pulled it completely out of my still life shadow box setup. Has anyone else had this "problem"? As it was thoroughly entertaining, I hesitate to call it a problem. The items: As the daily painter Carol Marine says sometimes still life arrangements made of food get wilted looking. My parsley just looked pretty beat up by the time Binkie finished with it. Fortunately, I had more. As you can see from the second picture, I changed my arrangement to include a marble cheeseboard instead of the red plate. Binkie enjoying the vegetable challenge! 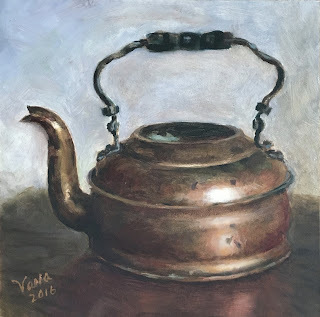 This painting was created for the Daily Paintworks "Antique Challenge." 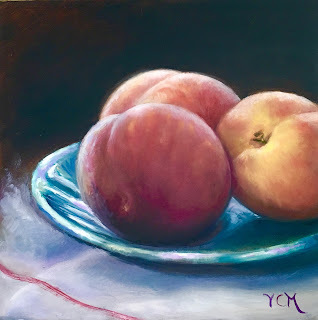 I was a little surprised that this challenge came immediately after I posted my Tarnished Treasures painting because that made it ineligible for the challenge. However, I knew that I had plenty of antique and vintage items to create another. I love lace and wondered how to go about painting it. I discovered the easiest way to create the lacy parts was to add the darks into the whites rather than the other way around. 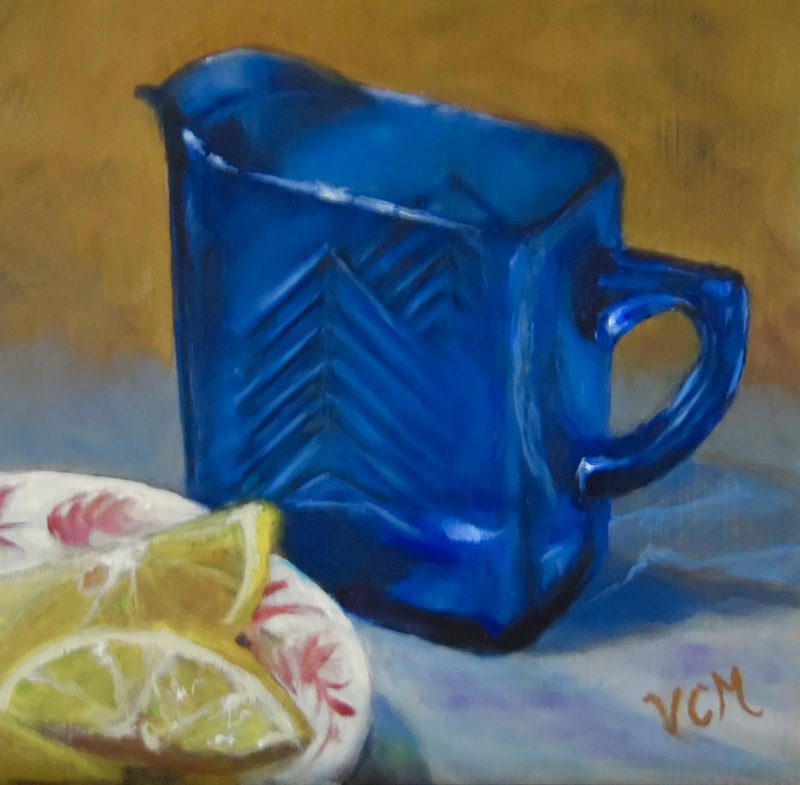 Everything is old in this painting--except the lemon! The items: The teacup is a vintage blue (though the company called it mauve!) teacup called Harlequin ware. The same company that makes Fiesta ware made Harlequin ware. The spoon is just one of many silver spoons that I found in an antique store. The lace napkin came from my grandmother and it's part of a set that goes with an old cutwork tablecloth. 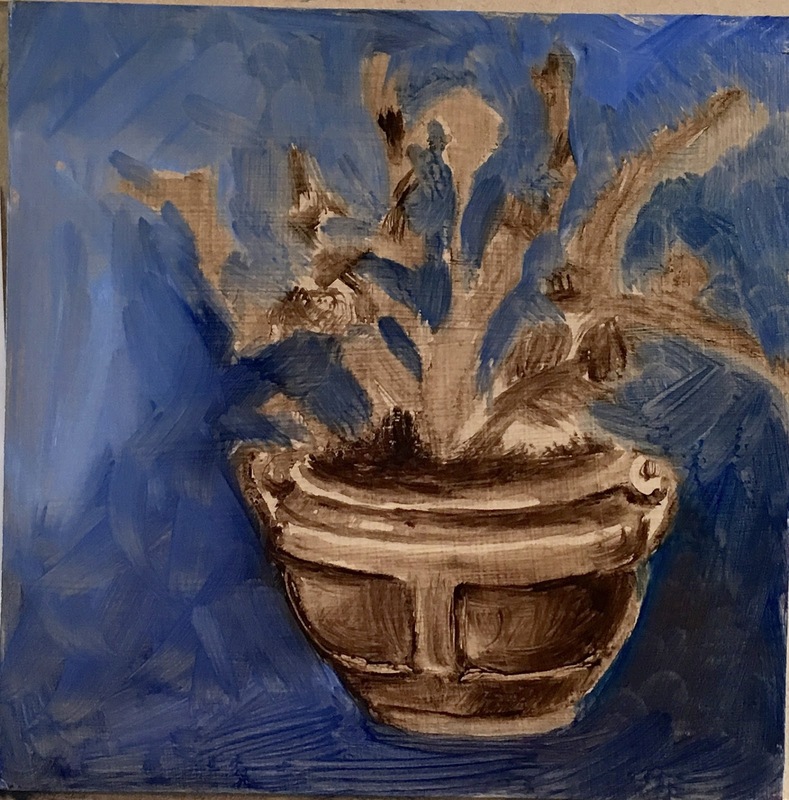 Underpainting: Here's the underpainting that I did as I started this painting. It really helps to get the tones correct when I do this. Sometimes as I'm painting, I lose the lines, but the tones are still there. As I mentioned in an earlier post, I usually do this with a mixture of burnt umber and medium. 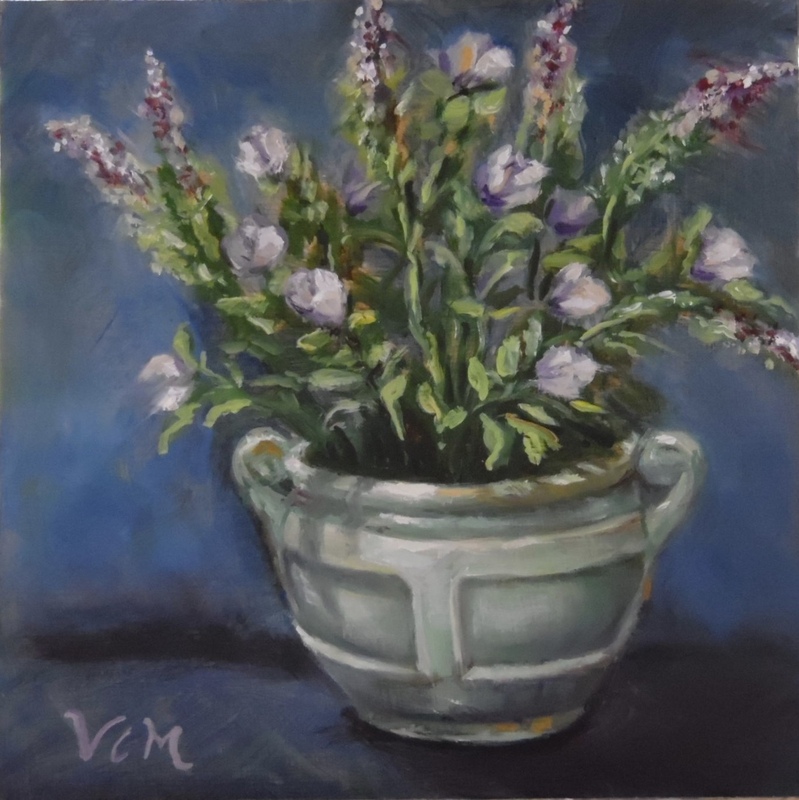 The vase in this painting is signed on the bottom with the distinctive mark of the Rookwood pottery company. I inherited it from my mother who inherited it from her mother. The color is a bit more muted on the actual vase but I took some artistic license with it. The roses are three different varieties of knock-outs from my garden. I don't have much of a green thumb but I love roses and gardenias and while I have killed many a bush, a few have survived despite my lack of talent for growing things. The "art" of painting roses: This is my third attempt at painting roses and it is fascinating and difficult. They are such intricate flowers that it will probably take me a lifetime to master the technique. FYI: Cats love to behead flowers and so I rarely can keep cut flowers in the house. Usually I find a pile of petals on the floor or table and no sign of the criminals. Fortunately, roses are one of the few flowers safe for cats to eat. This is my first blog entry using my new iPad Pro. Keyboard hasn't arrived yet and I touch type, so it's a bit slower going right now. 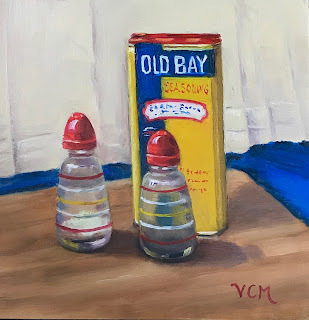 My husband saved this Old Bay can and was ready to take it out to his domain (otherwise known as the garage) when I spied it and immediately thought "painting." I love old stuff and especially old kitchen stuff. This was both fun and challenging . Lettering is VERY difficult. I used only suggested letters on the smallest areas. Stripes are also fun--Not! I saw this silver gravy boat in an antique store and immediately knew it would make a great subject for a painting. My first instinct was to polish it but my husband said to try painting it tarnished. Pairing it with two other old objects gave it even more significance. The book is my favorite swashbuckling romance from the 1940's, Captain Blood, and the glasses belonged to an ancestor--though I don't know exactly which one. They are incredibly small! Our noses are much bigger today. The book was originally resting on a dark gold (yellow ochre) color. Changing it to red made everything show up better since it is the compliment of green. This painting was about getting the right color blue for this vintage art deco creamer. I love 1940's and 50's dishes! My sister gifted this to me after I kept admiring it in her house. This was my first attempt to paint a pattern on china and it was very satisfying--and not as hard as I'd imagined. Of course, it wasn't a complicated pattern, but one must start somewhere. My new shadowbox: This was my first painting using my new shadowbox that my husband made using a pattern from Carol Marine's book. 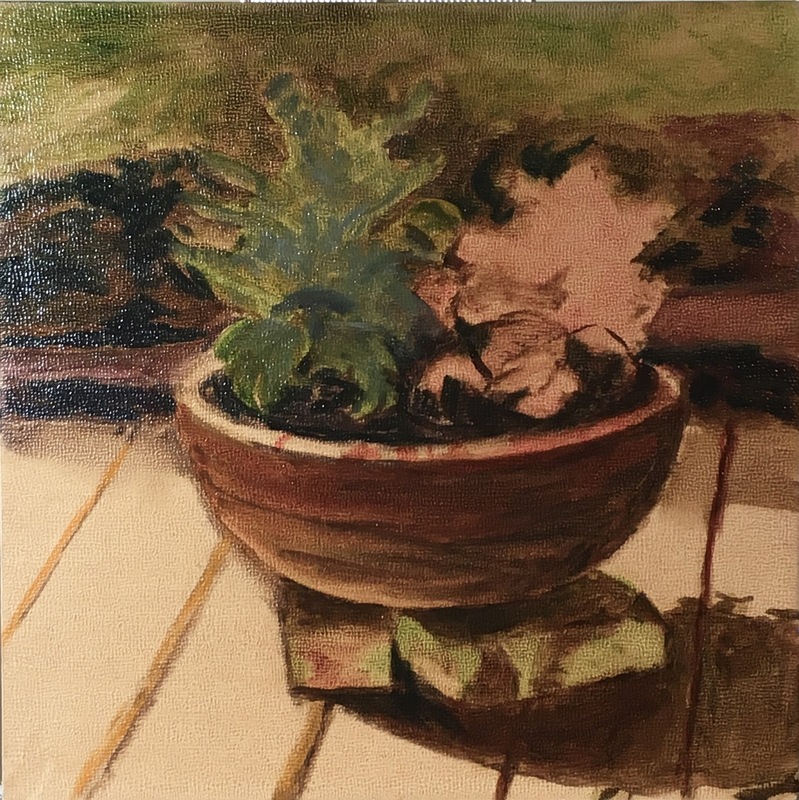 I tried working from a photograph of this arrangement, but could not see the highlights on the glass as well as painting it from life. The shadowbox is quite large so keeping my cats out of it has been a battle. Fortunately, I won this first round. McCoy Vase with Lemons- Click here to bid. This is a 9x12 inch painting on gallery wrapped canvas from my earlier paintings. The vase was bought at a bargain price from an antique/consignment shop. I love this old vase and have it sitting on a beautiful rustic shelf that my husband made. This painting has one coat of Gamvar varnish and is unframed. Finally decided to sell it to make room for more paintings. Signing issues: On my smaller paintings I usually sign my initials simply because there is so little room. Though this is a little larger painting, I decided to sign my initials since signing is so difficult. I may master the art of painting in about 20 years or so, but I will probably still have difficulty signing my name with a brush. There's good news though, I finally decided on what style of signature to use: print is easier than cursive. Painting these vintage shakers took me back to my grandmother's kitchen and all the cool retro dishes and appliances. 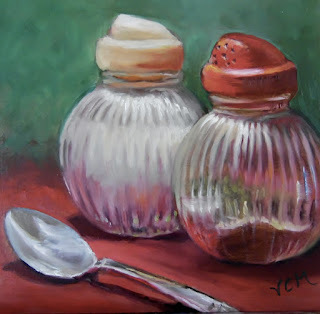 These shakers were difficult to paint (glass is hard for me) and at this point I can't part with this little painting. I may try a new arrangement of them and then I'll be able to sell one or the other. Drying issues: I've already started and finished another painting of a vintage kitchen piece but I want to let my paintings have a chance to dry before I post. When I started this blog, I didn't have a clear understanding of how long to wait before posting. Definitely, I need to let my paintings dry enough to varnish. I use Gamvar which can be applied as soon as they are dry to the touch; however, that can take at least a week or more. 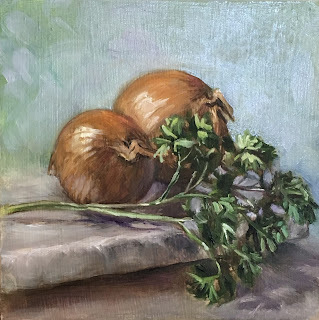 Painting this onion was fun! 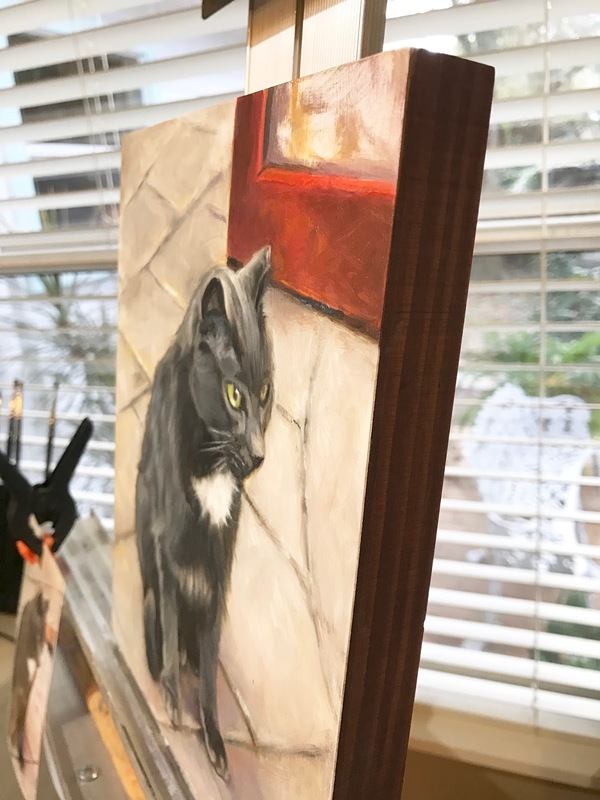 I started this painting with an underpainting of burnt umber and mineral spirits and everything was much easier after this. 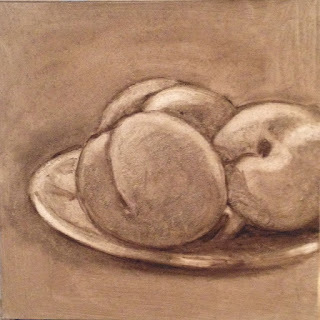 My own panels: On my previous small daily paintings I used Ampersand Gessobords. These are wonderful panels and I would recommend them to anyone who doesn't want to spend a little time making your own. Though I had never done it before, I decided I could make my own with the help of my handy husband--who knows how to work with power tools. So he cut a bunch of 6x6 inch panels from tempered masonite board (purchased from my favorite Home Depot), and I sanded and applied gesso (3 coats) to each small panel. First, I lightly sanded each panel with 150 grit; after this I applied the first coat of gesso. Then I sanded again between each coat with 400 grit sandpaper. Make sure you do it lightly. If you need more help, try this You tube video by Pauly Tamez. I watched many but this was one of the easiest to follow. Signing my name: This is difficult for me. Sometimes it looks like I've forged my own signature--but badly! So on some of these small panels I've opted for my initials. It gets the job done and is much less frustrating.